Chef Ed Lee takes brisket up a notch, blending bourbon, preserves, and spices for a deliciously flavorful recipe. To make the rub: Mix all the ingredients together in a small bowl. Cut the brisket in half, against the grain. Put it on a baking sheet and rub the brisket all over with the spice rub. Don’t be gentle with it – use all the rub in the bowl. Let stand in the refrigerator for 2 hours to give the brisket a quick cure. Position a rack in the upper third of the oven and preheat the oven to 300˚F. In a rondeau or a large shallow pot big enough to hold both brisket pieces in one layer, heat 2 tablespoons of the oil over high heat. Add the onions and garlic and sauté for 5 minutes, or until the onions pick up a little color. Transfer the onions and garlic to a plate. Add the remaining tablespoon of oil to the pot and heat until it’s nearly smoking. Add the brisket, fat side down, and allow it to brown, untouched, for 5 to 6 minutes. Lift one corner of the brisket and check it; it should be nicely browned. Using tongs, flip both brisket pieces. Add the onions and garlic to the pot, along with the carrots, celery, tomatoes, stout, bourbon, soy sauce, balsamic vinegar, brown sugar, beef stock, and thyme leaves and bring to a simmer over high heat. Cover the rondeau with a double layer of aluminum foil and transfer to the oven. Cook for 4 ½ hours. Resist the temptation to peek under the foil. Remove the pot from the oven and slowly pull back the foil. The brisket should be very tender to the touch but still hold its shape. Transfer the brisket to a platter and tent it with foil to keep it moist. Strain the braising liquid. 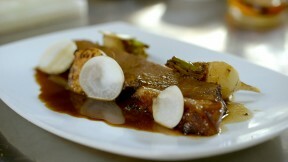 Reserve some of the cooked vegetables and ½ cup of the braising liquid for the glaze and return the rest to the rondeau. Turn the heat up to high and reduce the braising liquid for about 15 minutes. Meanwhile, to make the glaze: Combine the peach jam, the bourbon, and the strained braising liquid in a blender and blend until a smooth puree forms. Season with the salt and pepper. When the brisket has cooled a bit, using a sharp pairing knife, score the fat side of the brisket by making slits about ¼ inch deep in a crosshatch pattern. Preheat the broiler. When the braising liquid has reduced, return the brisket to the rondeau, fat side up. The liquid should only come about three-quarters of the way up the brisket, so that the meat is submerged but the fat is exposed; this is very important, so if it is not the case, take the brisket out and reduce the liquid as necessary. Glaze the top of the brisket with peach glaze, using 3 to 4 tablespoons. Transfer the rondeau to the broiler and check frequently. You want to brown the glaze without burning it; it should take only about 4 to 5 minutes. Transfer the brisket to a cutting board. Slice against the grain into thick slices and place on a larger platter. Ladle some of the braising liquid around the brisket. Drizzle a little bit more of the peach glaze over the brisket and serve with the reserved cooking vegetables.